What is great about RBR's online shop is not only the free worldwide delivery (for over 50€), but also 3 free samples with a purchase. After testing out their Milk Aquarelle foundation for a couple of times, I decided I need to get the full size in Coconut Milk Parfait. The foundation retails 53€ for 29 ml / 0.98 fl oz, with just one bottle you are eligible for the free shipping. The packaging is utterly gorgeous. 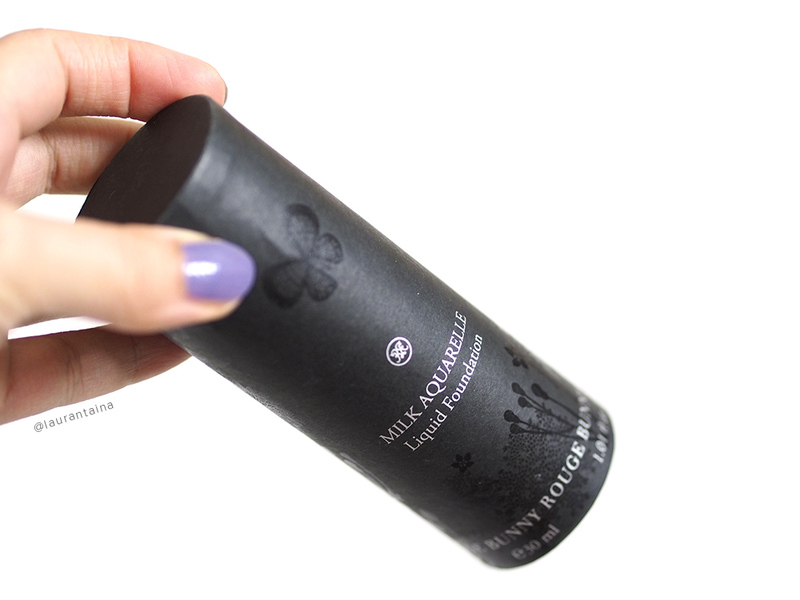 The foundation stands on a pedestal and the outer cone is sturdy black cardboard, printed with butterflies and wild flowers. Such attention to detail makes the frosted glass bottle with a matte black cap feel even more luxurious. I usually let go of boxes sooner or later, but this one I'm keeping it's original packaging, making my morning foundation routine even more ritualistic. And there's a pump, yassss, there is a pump! Don't you just hate unhygienic packaging and pouring foundation straight from a bottle? This pump is rather stiff, and products comes out squirting if you press too forcefully. I press very gently and keep my finger between the pump and the bottle, using only 1/2 a pump at the time. I'd say 1 pump is enough for the whole face. Unfortunately there are only 5 shades, all catered towards light to medium skin tones. If you are very cool or darker than medium, I'm afraid there's not a perfect match available. I find the color descriptions on the RBR website are quite accurate, but when it comes to purchasing foundations I always, always, need to test it out first. I'm rather picky about the base I use and in my ideal situation I want the color to match my skin and body as well as possible. If a shade needs to be adjusted by mixing foundations, applying a powder or bronzer - I just might skip it. 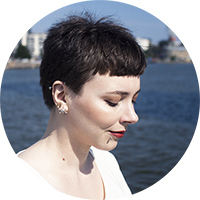 In Milk Aquarelle, Coconut Milk Parfait is a great match for me: a light warm-neutral shade, close to MAC Studio Sculpt NC15 (notice that my hands are quite tanned right now). 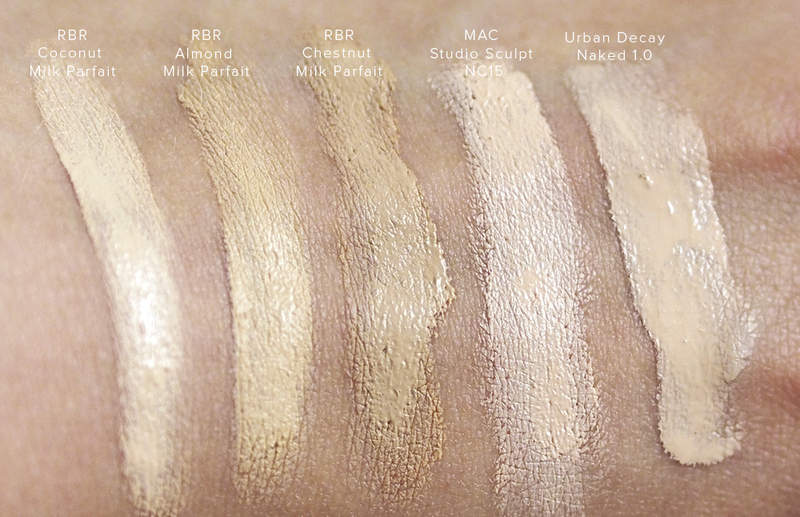 I tried wearing a sample of Almond Milk Parfait and it looked very pretty, but in comparison to Coconut Milk it's much warmer and darker, more like MAC NC20. I'd call Rouge Bunny Rouge Milk Aquarelle "a good face day" foundation. Despite the name, the texture is a creamy gel, which my dry/dehydrated skin likes very much. Unfortunately the foundation clings to any dry patches I have. On acne medication my skin's been drier than a desert, especially the nose, chin, and cheek area look patchy with any make up on. If I have properly exfoliated and moisturised, there is no problem. Milk Aquarelle's coverage is buildable light-medium, and blends effortlessly with a goat hair brush like Koyudo fu-pa. One pump of foundation won't cover all my imperfections or redness, but creates an even canvas with a beautiful, luminous finish. Especially if you're dehydrated or dull, this fresh and "lit from within" look may be to your liking. 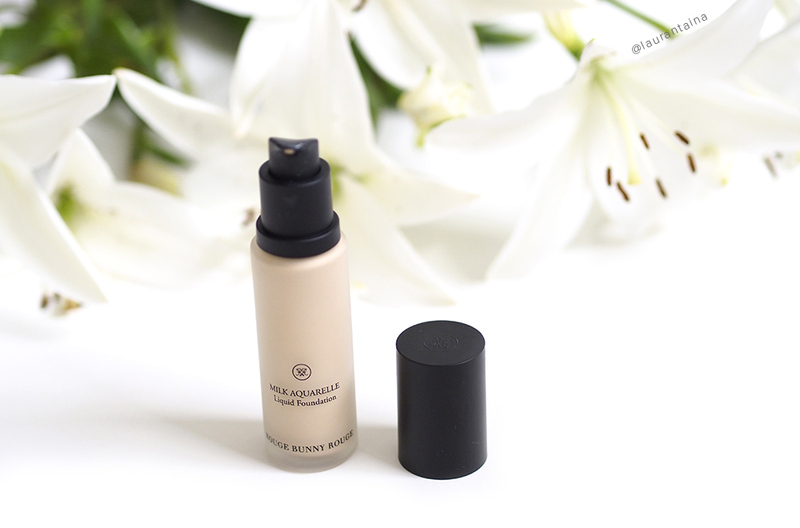 RBR Milk Aquarelle has become one of my go-to favorite foundations. I wear it on days when I need little extra coverage and want a luminous, glowing finish.